Nigerian Biography: Biography of Shehu Shagari; Ex-President; Politician; Sokoto State Celebrity. 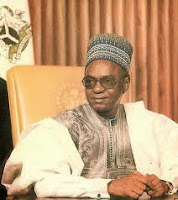 Biography of Shehu Shagari; Ex-President; Politician; Sokoto State Celebrity. Shehu Usman Aliyu Shagari, Turakin Sakkwato was born on February 25, 1925 to the family of Magaji Aliyu and Mariamu both of Fulani extraction in the Northern Nigeria. At the age of four, Shehu Shagari was registered in a Quranic School. From there, he attended a primary school in Yabo, and later attended Sokoto middle school, from where he went to Kaduna College, a school originally created to be a teacher training college. After the college, Shehu Shagari became a science teacher at the Sokoto Middle School. From there, he moved to Zaria Middle School. Thereafter, he became a headmaster of a primary school in Argungu. In 1946, Shehu Shagari and Mallam Gambo Abuja jointly formed the Youth Social Circle, a political organization that operated in Sokoto. Some Northern Elites of that time like Ahmadu Bello, Ibrahim Gusau, and Mallam Ahamdu Dabbaba supported the movement. In the year 1958, Shehu Shagari was appointed parliamentary secretary to the Prime Minister, Abubakar Tafawa Balewa. Arround the same period also, he was elected to represent his constituency (Sokoto Southwest) in the parliament. It is worthy of mention that in the year 1948, the Youth Social Circle of Shehu Shagari merged with some other political groups to form the Northern People's congress, and in the year 1959, they won a national parliamentary election. In the years 1960 and 1962, Shehu Shagari was made the minister of Economic Development and minister of Internal Affairs respectively. In 1965, he became the minister of Works and Survey. When the military ousted the government, Shagari returned to Sokoto where held the position of a Councilor, representing Sokoto Native Authority. In 1970, Yakubu Gowon made Shagari the minister of Economic Affairs and that of Finance. In the year 1979, Shehu Shagari won a presidential election and became the president of the Federal Republic of Nigeria between the years 1979 and 1983, before his government was overthrown by the military.